There are meals where every bite is a revelation, old world views crumble, and life takes on new meaning – the pursuit is pushed forward and there are new realms to explore. It is magical when it happens, smiles everywhere, but time, and continued avocation, often cruelly reveal the legitimacy of those epiphanies – there are few – and what was once the culminate becomes the stepping stone – local maxima. 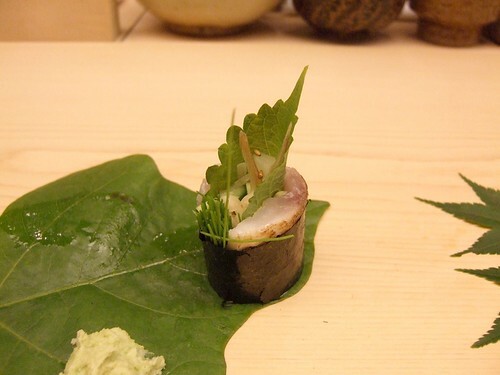 Sushi was one of those first gateways for me – I thought I knew sushi – I still don’t – but nothing I’ve had1 compares to the Sawada meal below. This is Rome before the fall – French haute cuisine in its heyday – one man in pursuit of his own perfection – an artisan only serving what he deems worthy of his absolutely high standards – priced accordingly. 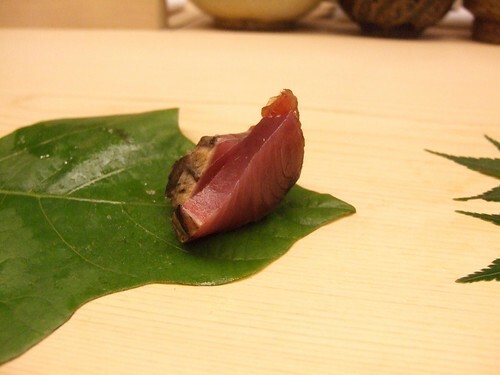 The Tuesday lunch was filled with many proclamations, some implied, others on proud display – the highest-bidded (200kg+) tuna of the day from Tsukiji, broken down in front of us, to the house-made bottarga – served unadorned, its genius laid bare – its intense briny concentration tremendous. 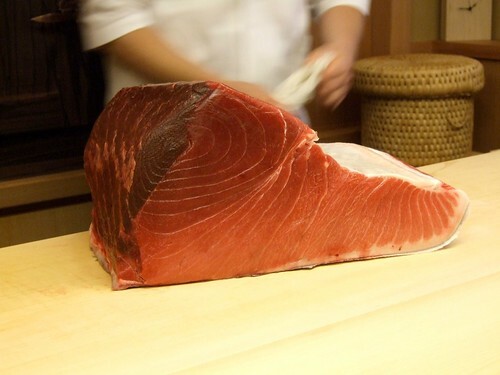 A fair amount of fish available is not served – cut, inspected, re-inspected, and tossed – presumably because it did not meet some internal standard, as it should be in more restaurants across the world. 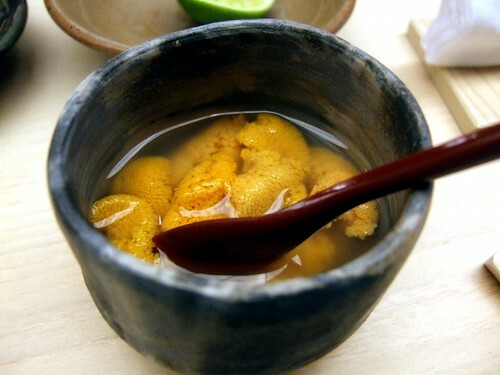 The cold bowl of uni (origin forgotten) was beyond pristine – look at the picture and its tongue-like surface intact – an extraordinary salvo near the beginning of the meal. 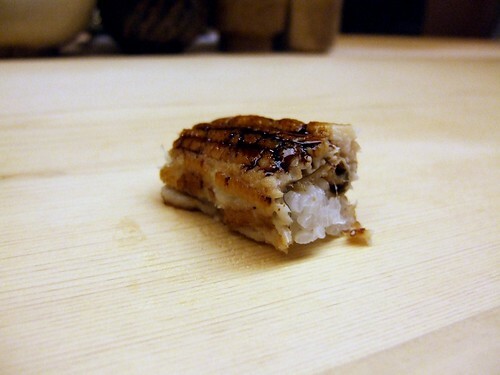 That dish alone encapsulated the entire experience – the utmost complexity masquerading as simplicity. 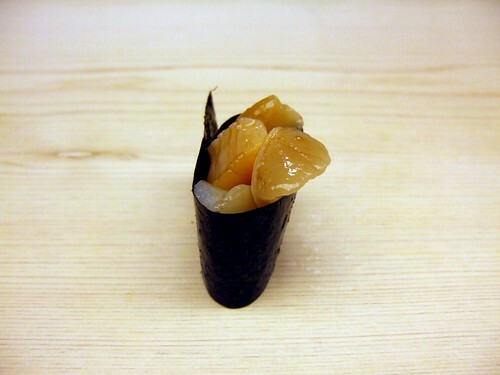 Rarely is uni served in a cold brine (in the US, at least) and, yet, why should it be served otherwise? 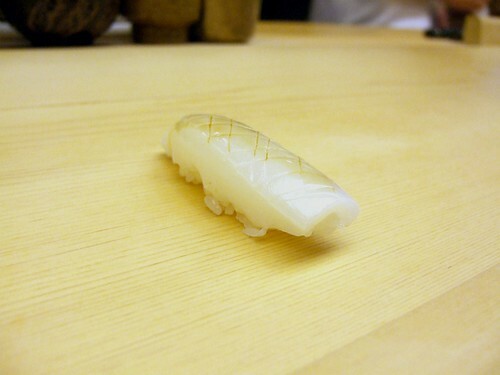 After the sashimi courses, the sushi comes, piece after piece. It is a story of the sea – to the day – as told through a master story-teller. 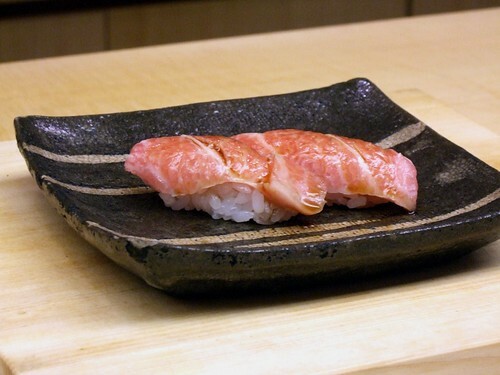 The chuotoro was the star on this day, combining the luxurious fatty mouthfeel of toro but retaining the strong flavor of the best maguro. 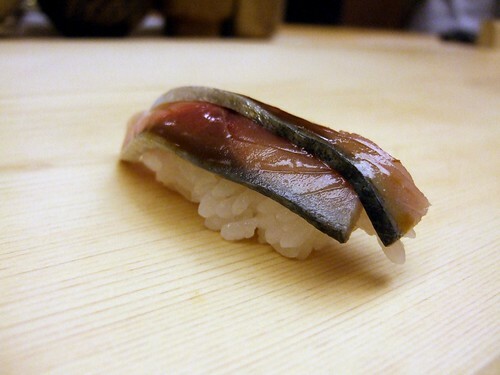 If you look carefully at the various nigiri, you’ll see the intricate cuts in most pieces of fish – not unique to Sawada of course – but there are many lessons in those cuts – keys to deciphering the different textures of each fish. 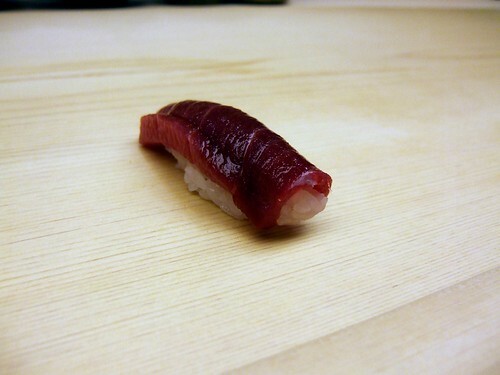 Aged tuna? The previous Sunday’s lunch included the object of black art2. 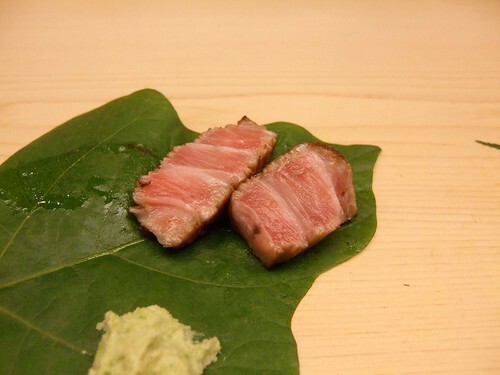 Its taste was more intense, somewhat analogous to the difference between regular and dry-aged beef. 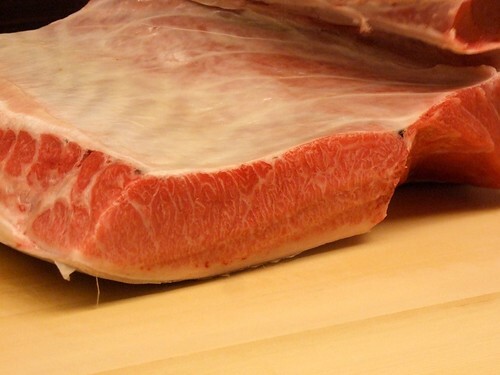 The color correction in that post is a bit off, as the meat could be mistaken for whale, but the meat does have a darker hue to it. 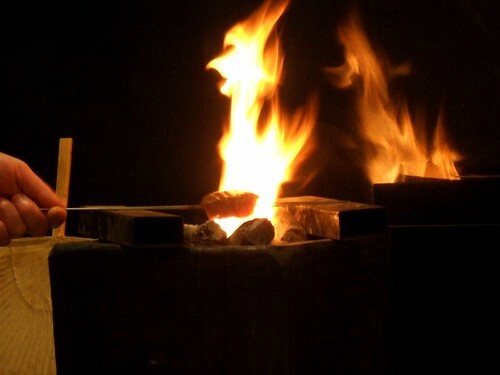 It would probably take many meals, throughout seasons and across species, to get a firm (no pun intended), and factual, handle on different techniques used. 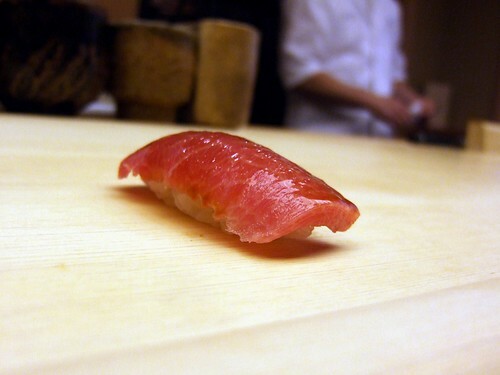 (I recall reading that Sushi Yasuda preferred to freeze his tuna as the ice molecules break down the fat and yield a more toro-like texture.) There is a lot of misinformation out there and, presumably, amateur practitioners – the results at a place like Sawada speak for themselves. 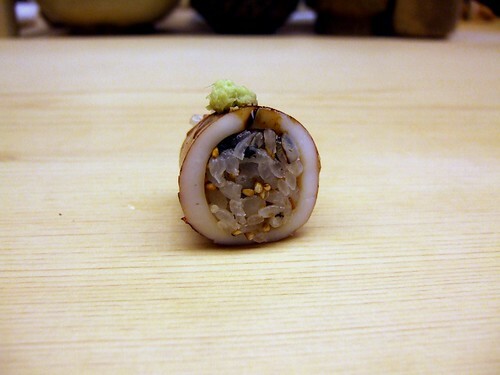 We were the only people that day for lunch – one of the world’s top sushi chefs – ours. 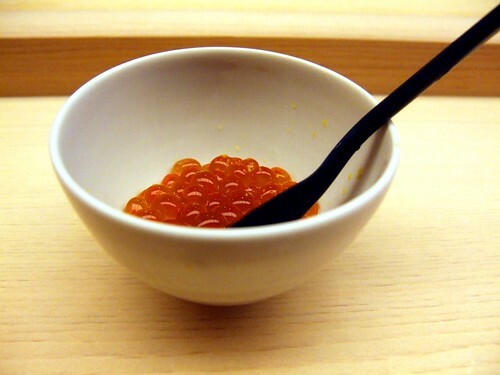 When was the last time Alain Passard cooked just for you? 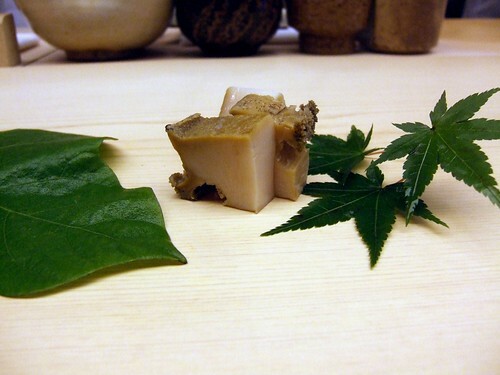 Go – it costs as much as any restaurant in Europe but it reaches, and attains, a higher perfection. 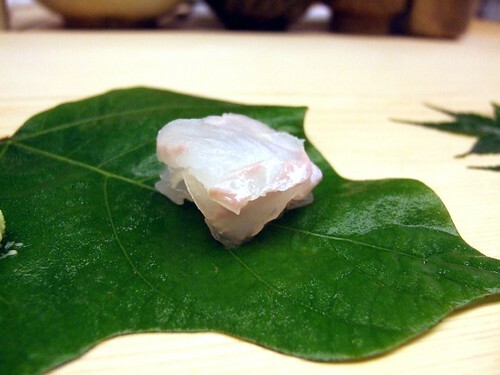 1 – In Tokyo, this includes Harutaka, Sushiso Masa, and Sushi Mizutani. In the latter, the potential exists but it did not deliver on my single meal. 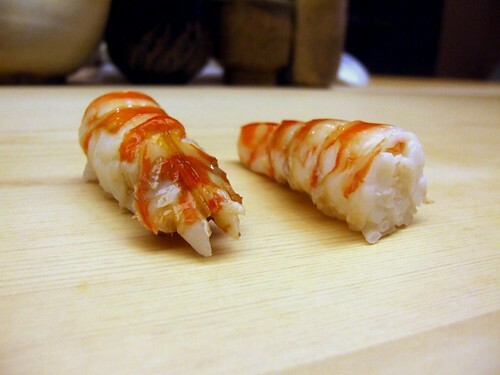 I must still try the infamous Sukiyabashi Jiro and the other three-star – Sushi Saito. 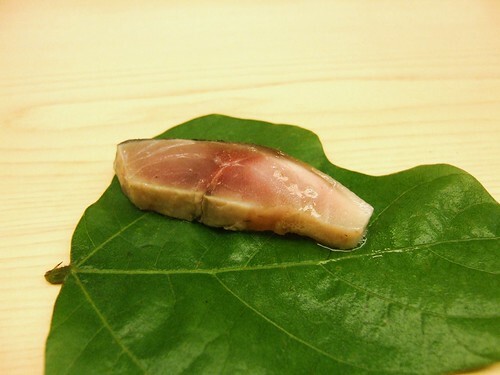 2 – Black art or not, this incredible Gastroville post reveals some rare insight into aging tuna – fresh may not always be best. 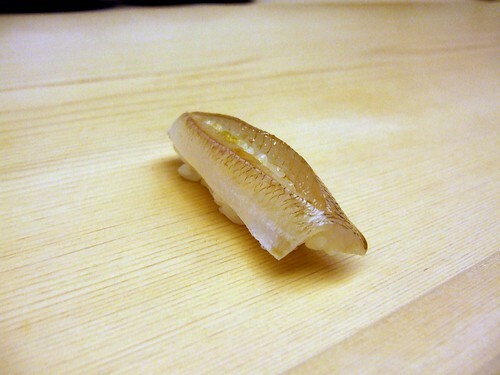 And another post on speared fish and ike jime. 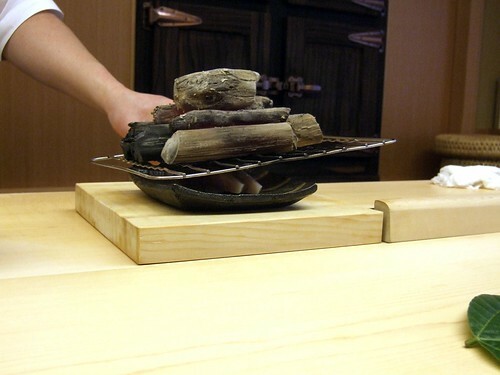 Cooking Issues also has a series of posts on ike jime on their excellent blog. wow that looks insanely awesome. Seeing those pictures and your review brings back fond memories of an almost similar meal I’ve had there a few months ago… My thoughts about it were similar. It caught me by surprise even as I was expecting a lot about Sawada. 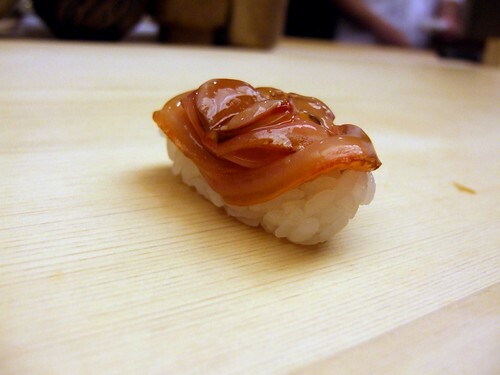 That looks so amazing. 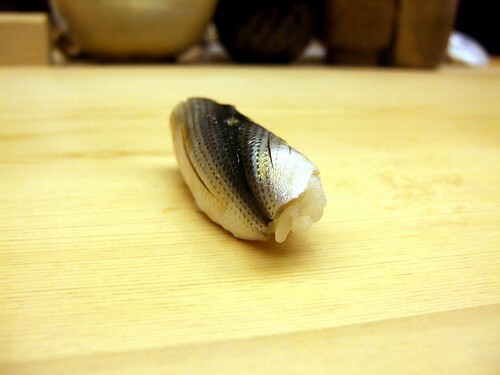 I’m especially curious about the uni in cold brine. Lucky you! Amazing post! But I do have a question: what is your view on the depletion of the world’s bluefin tuna due to excessive demand and overfishing? 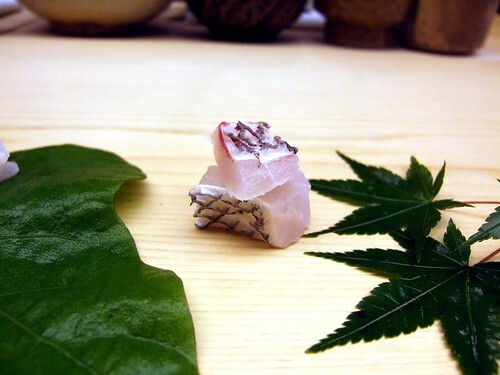 Do you remember what that is next to the Bottarga? Everything looks so amazing! I’m visiting Tokyo for the first time in October and I am extremely excited! 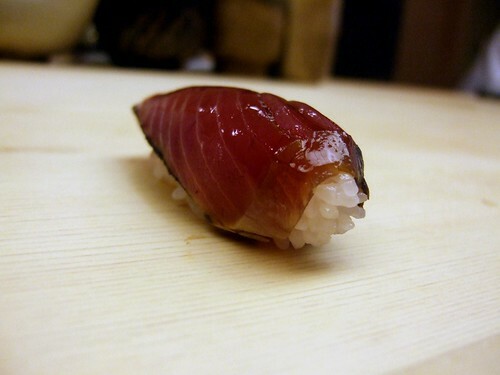 I will be there for 7 days and I’ve decided that I will do one of my lunches at Sushi Saito but want to do one more lunch and/or dinner at another sushi restaurant. 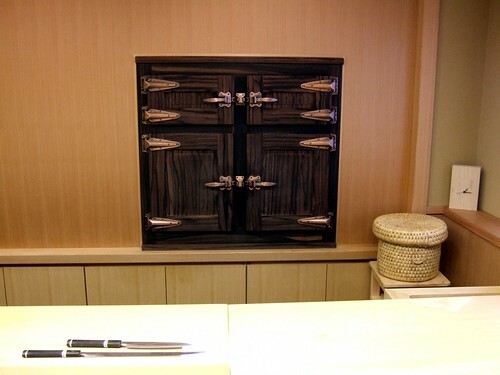 I can’t decide… I’m thinking of either Mitzutani, Sawada or Jiro. Any recommendations? Hi Helen, my 2 Sawada meals were much better than my Mizutani meal; but i know there are people that would vehemently disagree with me. 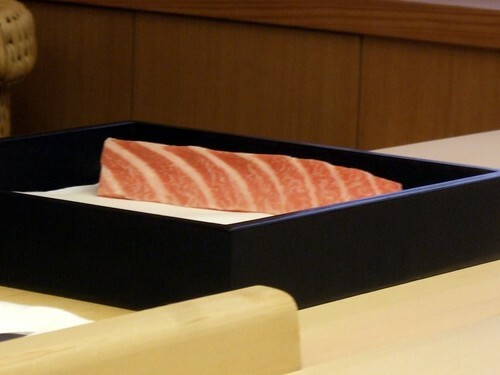 wow, look at the OTORO BLOCK! lots of great reading – thanks for the post. 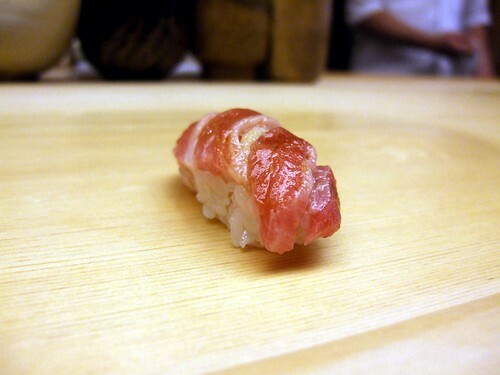 salivating about going over to japan. one day! Not me. 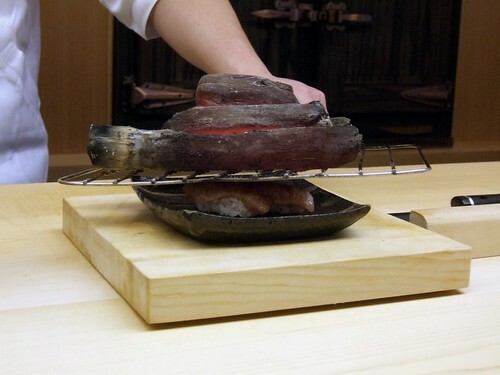 While I did enjoy Mizutani, my dinner there was rather more restrained than the lunch I enjoyed at Sawada – a three hour extravaganza that was as much a show as it was a feast. 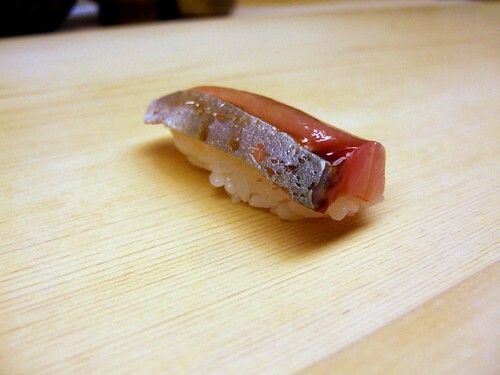 Also, went to Sushi Saito for lunch on my last trip and, while very good, Sawada remained the most memorable sushi-ya. Question for you, Chuck. 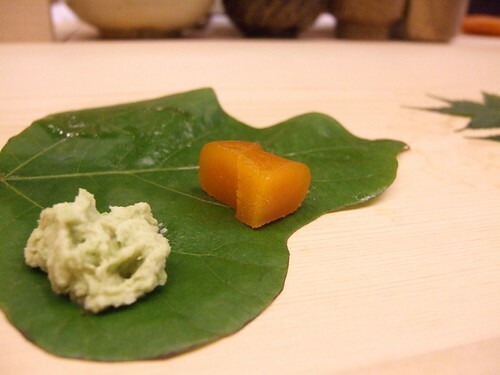 Of all the big restaurants I hit while in Tokyo, the Sawada meal was the only one I don’t have pictures of because my hotel informed me photography was not permitted. Did you ask in advance and get the okay (suggesting a change in policy or a miscommunication on the part of my hotel), ask on the day, or simply start snapping away? 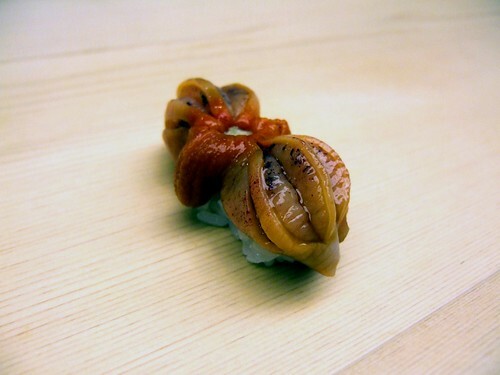 Joe, went to Sawada twice. First visit was 11am and we were the only people for most of the meal – he asked me to stop taking photos once others arrived. Second visit – we were the only people that afternoon for lunch so I was free to take pics of the entire meal. 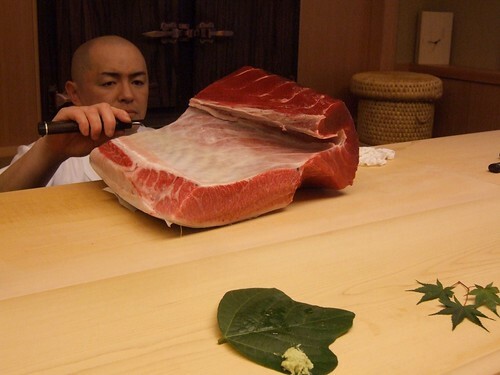 The technique of aging tuna is explained by Jiro(Sukiyabashi Jiro) in one of his books, I think it was first wrapped in absorbent paper, then plastic and put in a styrofoam box with crushed ice covering the “tuna package” and then put in a fridge for about 2 weeks. How did you manage to take pictures? Was it just in recent years that photography is prohibited? So sad!! i need to beg then. haha!! can’t wait!! 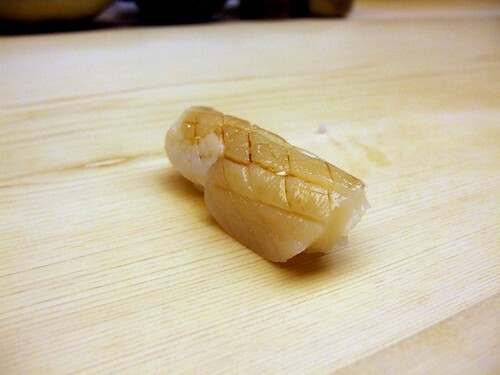 especially for his otoro no aburi!